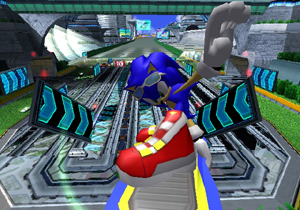 As I ride the JR Sobu line back to my apartment, I clutch Sonic Riders in my anticipatory little hands. My Final Fantasy 7 shirt is chafing me. Yellowing at the pits, frayed around the edges, resembling cheesecloth; this is my preferred garment for the almost daily ventures I make into the sweaty markets of Akihabara. I don this apparel so people know what defines me: I AM A GAMER. And they recognize this. How else could I have purchased a copy of Hyrule no Densetsu Regend of Zeruuda: Kaze no Taakto (that's The Legend of Zelda: The Wind Waker for you poor fools that chose to play the MANGLED American translation) for just 9600 Yen? Clearly, this is why I am here. They know I belong. It is the beating heart of Japan, and I am a lowly red blood cell moving amidst the organs I call my neighbors, my friends. And yet, after being shoved down to the ground and beaten savagely by street gangs for choosing to come to the marketplace in the traditional kimono of samurais, I feel alone. And be on they guard against the good and the just! They would fain crucify those who devise their own virtue - they hate the lonesome ones.The car vibrates under my feet. I feel like Sawao Yakamana of the pillows when he asked on their hit 1998 album "Little Busters," "Can you feel? Can you feel the hybrid rainbow?" If Sawao was here, I would stop at the nearest barru (bar) and we would split a bottle of Yebisu. The condensation on the bottle would collect, and I would draw the star of Nintendo's Hoshi no Kaaby (>^ 0 ^)> He would laugh and place his hand in mine, since we share the language of the heart, the language of emoticons. Afterwards, I would invite him back to my pad where we would sit on my futon and watch Naruto (you may have seen the "domestic" version, and no, I won't tell you what happens even though we are YEARS AHEAD). Sawao and I would hold each other, not out of any kind of homosexual desire, but out of our respect for each other as artists. I would strum the only chord I know on my guitar, the chord of "A." As the notes reverberated off of my Rurouni Kenshin wallscrolls, he would ponder upon the importance of filler episodes of Japanese animé while I would boil up some fresh ramen and reply "Sumimasen, sumimasen!" because I cannot understand Japanese. But I understand the spirit. It is my spirit. I see three girls sitting next to me. One of them is holding a Game Boy Advance, and on the small, faded screen I see Pokettsu Monsuuta, which many of you may know by the rather plebian American buzzword, Pokémon. I have an urge to request a monsuuta trade, as a high-level beroringa is the trump card I need for my currently-lacking team, but I suppress this desire, even though the faded image of Cloud Strife on my torso begs with his deep, azure eyes. His eyes reflect my own; we have the same concerns. Perhaps I can prevent one of these girls from being impaled by a long-haired stranger. Thankfully, I have a katana on hand. Cloud, I will not let what happened to Aerith happen to at least one of them. I zip my windbreaker over his face and I am once again reminded of Miyamoto-sama. Even the Strawberry Pocky I am errantly nibbling on cannot distract me from the image of this bowl-cut God of video games. He has touched the lives of all us, from these young children who have now moved a few seats away from me, to the very large culture I am a part of. A new, throbbing erection pushes against the inside of my jeans, but it's okay. Miyamoto fulfills me in a way that no woman can. The girls rush to the back of another car, screaming and leaving most of their goods behind. I will have their beroringa. It is the interactivity Miaymoto-sama would approve of. Draw Your Way across a Cliff!